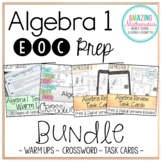 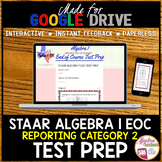 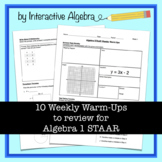 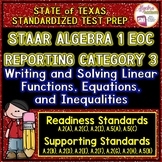 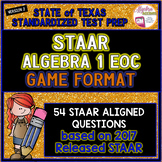 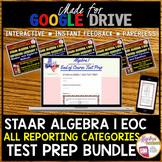 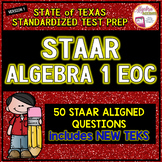 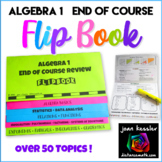 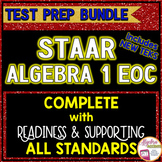 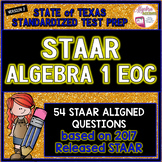 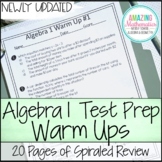 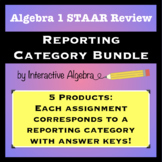 Algebra 1 STAAR Review Booklet - Updated for the new TEKS (2017)!This is a review booklet written to help students prepare for the State of Texas Algebra 1 STAAR test. 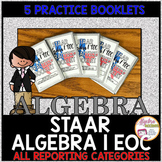 The booklet is made up of 4 pages printed front to back and folded in half. 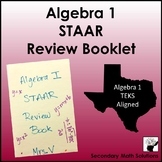 The booklet is finished with a construction paper cover. 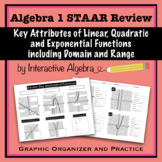 This is a graphic organizer and practice problems over the 3 types of functions covered in Algebra 1: linear, quadratic, and exponential. 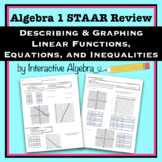 On the front side is review over the key attributes of the different types of graphs, including the parent functions. 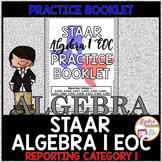 On the back is a review of domain and range. 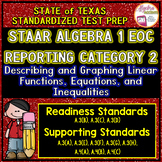 50 questions covering all reporting categories and both supporting and readiness TEKS standards: A.2(A), A.2(B), A.2(C), A.2(D), A.2(H), A.2(I), A.3(A), A.3(B), A.3(C), A.3(D), A.3(E), A.3(F), A.4(C), A.5(A), A.5(B), A.5(C), A.6(A), A.7(A), A.7(B), A.7(C), A.8(A), A.9(A), A.9(C), A.9(D), A.9(E), A. 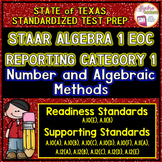 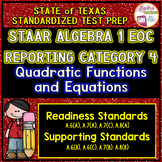 54 questions covering all reporting categories and both supporting and readiness TEKS standards: A.2(A), A.2(B), A.2(C), A.2(D), A.2(H), A.2(I), A.3(A), A.3(B), A.3(C), A.3(D), A.3(E), A.3(F), A.4(C), A.5(A), A.5(B), A.5(C), A.6(A), A.7(A), A.7(B), A.7(C), A.8(A), A.9(A), A.9(C), A.9(D), A.9(E), A.